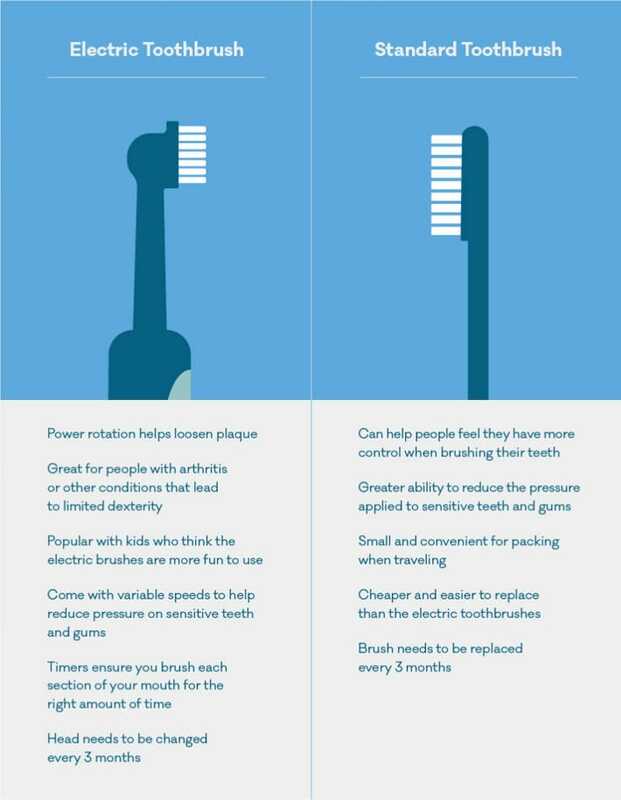 Electric vs Manual Toothbrushes - What's Best? Home News and MediaElectric or manual toothbrush? It’s an issue that can cause a lot of debate, but are electric toothbrushes really more effective than a manual toothbrush when it comes to cleaning and taking care of your pearly whites? We take a look at the key differences, and whether you really need to fork out for that sparkly new electric brush. One of the main benefits of manual toothbrushes is that there’s a wider variety of options. You can get large, medium or small toothbrush heads, as well as a handy tool on the back of the head to help keep your tongue clean. Manual toothbrushes can help you feel like you’ve got more control over the brushing process, including how hard the pressure is on their teeth. This can be particularly helpful for people with sensitive teeth and gums, who are able to respond to twinges of discomfort by applying less pressure. Manual toothbrushes are also significantly cheaper than electric toothbrushes, making them much easier to replace. As they’re smaller, they also pack more easily when you’re travelling, so you never have to go a night without ensuring your teeth are sparkling clean! One of the main benefits of electric toothbrush is that they do a lot of the work for you, with a power rotation that helps to loosen plaque. This can be a huge benefit for people with arthritis or other conditions which limit dexterity. The range of variable speeds can also be helpful for people with sensitive teeth and gums, and some of the higher-range electric toothbrushes even have a warning light that acts as an alert if too much pressure is being applied. Electric toothbrushes are often great for kids who are reluctant to brush their teeth, as electric toothbrushes can seem more fun for them to use. Many electric toothbrushes also include an in-built timer to make sure you’re brushing your teeth for at least two minutes, and give guidance about where in your mouth you should be brushing, to help ensure you brush all four quadrants of your mouth. With both electric and manual toothbrushes, you should look to change your toothbrush or brush head every three months. If you’re currently undergoing orthodontic treatment, you’ll need to change your toothbrush more regularly, around every six to eight weeks. When kids first start being responsible for brushing their own teeth, a manual toothbrush can be a better option, as they are lighter and more easy for a child to control. However, as kids get older an electric toothbrush designed especially for children might be a more suitable option. Not only can it be easier for them to handle and manoeuvre, but the in-built controls time their brushing sessions and can encourage good oral hygiene behaviours. Furthermore, some kids enjoy using an electric toothbrush much more, which makes the ritual more engaging for them. In summary, both standard and electric toothbrushes can be used just as effectively to keep your mouth clean and your teeth healthy. The key is to brush and floss every day, regardless of the kind of brush you prefer. Both types of toothbrushes have their advantages but both types will get the job done as far as removing plaque, if used properly. This Australian Society of Orthodontists’ blog post was based on content supplied by Ocean Orthodontics.